From fresh, soft summer breezes to an old-fashioned winter snow scene under a full moon – a beautiful garden endures. River City Gardens can help you create a little heaven on earth. Contact me now! 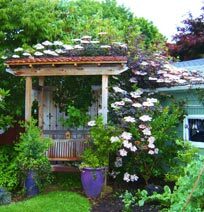 River City Gardens is a small sustainable landscape design company in Portland, Oregon. The heart of River City Gardens is Kathryn Leech, APLD, a Certified Landscape Designer with many years experience in gardening, garden design, ornamental pruning and consulting on landscape installations. View a selection of photos from my past and current work presented in my slide show.